Teaching Latin during the academic term has given an opportunity to develop and test a proper method of drawing others into and guiding them in their encounter with the language. This method of teaching has been recorded in our first book Ossa Latinitatis Sola : The Mere Bones of Latin which presents the mere bones or skeletal structure of the language through one hundred and five encounters over three academic years. Accompanying each of the five experiences is a collection of real latin texts taken from authors of every age who become our guide and textbook. 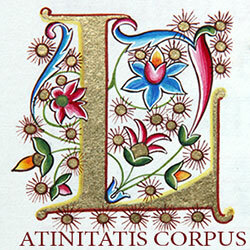 They contain innumerable examples to illustrate every aspect of the Latin language. In these Latin texts teachers are encouraged to find examples to illustrate each aspect of the language and to compose fresh collections of reading sheets annually. To help teachers with the task of finding examples to illustrate each encounter in the Ossa book, there is projected an accompanying volume entitled, Ossium carnes multae : The Bones’ Meats Abundant, which will provide specific examples from Cicero’s familiar letters so that we may learn from his vibrant, living language. Accompanying this volume we intend to produce a collection of audio recordings of these same incomparable letters of Cicero. We tentatively call the collection of recordings, Os praesens Ciceronis epistularis : The Mouth of Cicero in Person in his Letters. Another offering that we shall present is a collection of school worksheets that guide the student in the learning of the language. We call these worksheets ludi domestici or “home games”. Producing new Ludi yearly for several decades while teaching in Rome means that all we need to do now is collect them and arrange them according to their corresponding encounters of the Five Experiences. This third volume of Ludi we call: Ossibus ludi exercendis : Games for Exercising the Bones. Reginald's first published chapter on the principles of the subjunctive, purpose and result clauses, the gerund and gerundive and much more is in "Appreciating the Collect".